$10M market cap explorer Mining Projects Group (ASX:MPJ) has been working away behind the scenes for almost a year, building up to imminent, deep and comprehensive nickel sulphide drilling in a highly prospective WA Nickel Province. Whilst it doesn’t happen every day, Sirius has shown how a stock can react to a robust nickel discovery – for one reason or another, nothing excites the market like a big nickel find. The team of Geologists and Geophysicists steering MPJ were involved in the Sirius Nova discovery and Western Areas’ Spotted Quoll and Flying Fox deposits. In a recent news article they have said they regretted not taking shares as payment in these companies as the share prices rose in the tens of thousands of percent on discovery of Nickel. These WA Nickel experts say they will not make the same mistake with MPJ, and have taken shares in the company as payment for their services. There are plenty of explorers rushing to make the next major Nickel find, but we are interested in MPJ because they are set to announce the start of drilling any day now (if they haven’t already). Drilling targets generated by the best nickel geologist and geophysicists in Australia, both taking some of their payments in MPJ shares – shows supreme confidence. Geologist and technical director: Neil Hutchison – Neil is also GM of Geology for Andrew Forrest’s Poseidon Nickel. Responsible for global scale nickel discoveries at Windarra and Cosmos. A leading expert in WA Nickel. Neil has re-analysed 50 years’ worth of shallow drilling data on MPJ’s tenements, and concluded that some larger, deeper targets were completely missed by previous explorers. He is in charge of making sure these targets are penetrated directly during the upcoming deep drilling. Geophysicists: Newexco. Arguably the best nickel geophysicists in Australia are overseeing technical aspects of drill target selection for MPJ. Bill Amann and Adrian Black from Newexco helped discovered the Nova-Bollinger deposits, as well as Western Areas’ Spotted Quoll and Flying Fox deposits. The Newexco team with Neil Hutchinson form a highly experienced committee to steer MPJ’s drilling campaign to have the highest chance of success. Newexco’s have taken part of their fee in MPJ shares – shows their confidence in geology and chances of success. Neil Hutchison is also taking MPJ shares as payment for his technical services. Micro ~$10m market cap with $1.2m cash and liquid assets – share price is hugely leveraged to discovery – potential for major and ongoing share price rise in case of positive result. Dedicated share register – top 20 hold 72%, with MPJ management and vendors of the projects together holding 50%. That’s the basic summary of MPJ. “ an ASX stock close to a share price catalyst that could potentially initiate a share price movement. “ Read on for some more in depth information about MPJ and their near term drilling activities. MPJ is massively leveraged with a share price of less than 1c, and a market cap of under $10 million. The past has shown that the market reacts strongly to a monster nickel find from a penny stock. If you haven’t seen anything like this before, here is what can happen if a discovery is made. Now of course most hopeful explorers won’t be making any giant nickel discoveries, but here are some that did (which is what MPJ will try to do in the next few weeks). This is the chart for Sirius Resources – showing this share price rise after targeted drilling discovered Nova, then Bollinger – approximately 100km from where MPJ will be drilling for similar deposits in days. Remember that all 3 of the above discoveries were made by the very same geophysics team (Newexco) that MPJ are now collaborating with. It’s also important to understand the significance of Newexco accepting a substantial portion of their service fee in MPJ shares. If drilling and electromagnetics turns up nothing, they will have effectively worked at a massive discount. Reading between the lines – Newexco likely thinks there is a good chance of success. 5 bags, 10 bags, 20 bags, 100 bags – all possible, depending on the size and nature of the nickel system that MPJ may be about to tap into – but it’s also possible that drilling could yield nothing and the share price will go down. MPJ is that kind of high risk speculative investment. To mitigate this as much as possible, management has taken a strategic view in acquiring multiple core projects to ensure long term exploration upside. At least it won’t take long to find out what’s in store for MPJ, given that drilling is starting in days. MPJ is closing in fast on the commencement of a major, deep drilling campaign for a hot commodity, and in the heart of a proven WA Nickel Region. This drilling campaign will bring multiple price catalysts – not just the possible giant leap on a material discovery. 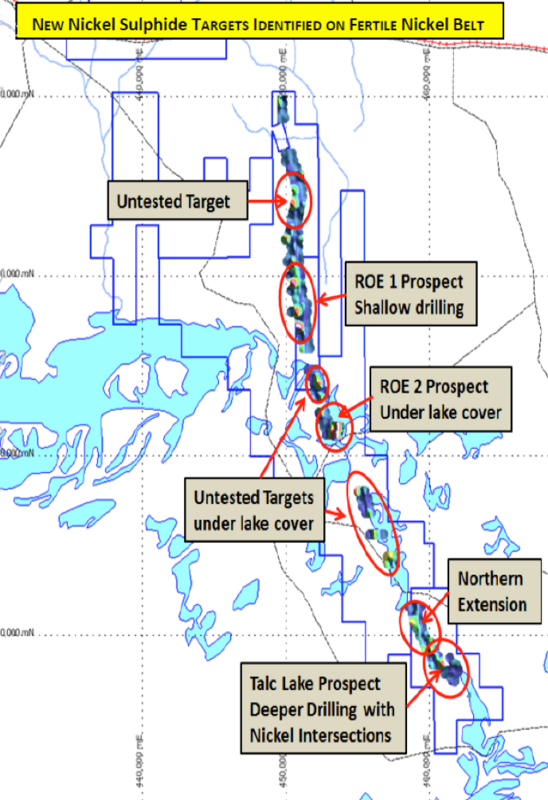 The official ASX announcement stating that this drilling program is underway will likely attract major market interest. A few weeks later, results will be released. That’s what we are here for – advance notice of impending price sensitive ASX news flow. Wouldn’t it have been nice to have been alerted when Sirius first began drilling at Nova? We expect MPJ will be releasing an announcement very shortly – if they haven’t already – that they have commenced drilling at its highest probability nickel sulphide targets. MPJ commenced its transition into a WA based Nickel play in 2013 when it acquired three core projects known as Roe Hills, Fraser Range and Dingo Range. MPJ went on to team with Bill Amann and Adrian Black from Newexco – the discoverers of Nova, Bollinger and multiple other economic nickel discoveries in W.A. MPJ also added another W.A. 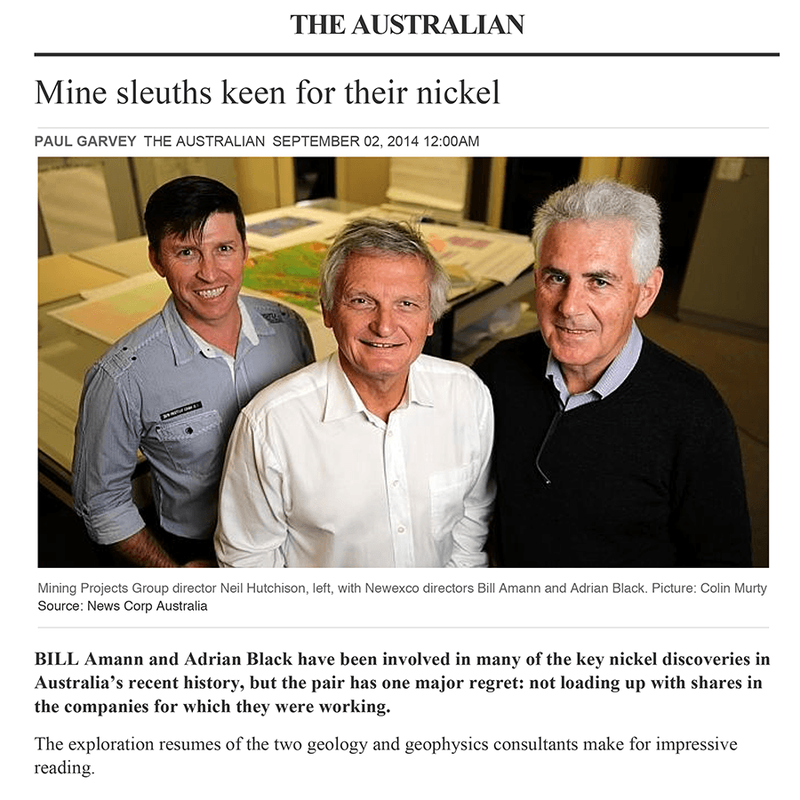 nickel genius – Neil Hutchison – to its nickel hunting arsenal. Neil discovered the world class Windarra and Cosmos nickel deposits, also in W.A. All three men have a substantial vested interest and belief in finding more big nickel deposits in WA with MPJ, as evidenced by the large shareholdings they acquired in MPJ as part of their remuneration packages. Last month MPJ raised just shy of $1.4 million to sophisticated investors at $0.006 – that’s only one tick below MPJ’s current on market share price. MPJ shares on market are at much the same price as placement takers over a month ago, and now just days before a major nickel drilling campaign gets started at Roe Hills. MPJ have spent many months preparing under the guidance of Neil Hutchinson, using advanced exploration techniques including the latest 3D modelling software, to utilise the extensive dataset accumulated over several decades of previous exploration. Soil sampling, geophysics, and rock chip assaying have also been used to hone in on the biggest and best nickel sulphide targets. And all indications are that the nickel sulphide targets MPJ has are some of the biggest and best in the entire region. Now it has come to crunch time. When MPJ and Newexco start intersecting fresh rock and assays as anticipated, investors jockeying for position and high volume trading is likely. Every new nickel sulphide target drilled in this campaign will be a new and separate price catalyst in itself. Then, with a market cap of just ~ $10 million, and a share price of under a cent, any high grade nickel assays could positively impact the MPJ share price. The efforts of nickel expert Neil Hutchison and Newexco have made drill targeting as refined and as accurate as possible, so the ultimate assays hold the best possible chance of revealing an economic discovery. With any luck this drilling campaign could deliver Australia’s next big nickel find, and potentially the ASX’s newest market darling.